Shrink Yourself: Break Free from Emotional Eating Forever is a book and online program created by psychiatrist, Dr. Roger Gould. Gould says that losing weight involves more than just eating less and exercising more. His program is designed to help people understand and stop their emotional eating habits so that they can be successful in losing weight and keeping it off for good. Gould stresses that his program is not a diet but rather involves a process, similar to therapy, that helps dieters identify and eliminate the habits that are interfering with successful weight loss. According to Gould the major reason why most diets fail is due to emotional eating and he provides dieters with information and tools to address this. Why you have good food days and bad food days. In what ways food has become your friend, your reward and your safe haven. What you are really hungry for (the emotional hunger that makes you eat). What feelings or relationship issues trigger your overeating. According to Gould hunger originates in your mind, not your stomach. Overeating is a habit that is built into the pleasure center of the brain and developed as a response to help you handle strong emotions and deal with life’s problems. He says the key to losing weight is to learn how to stop using food as a way to cope with fear, anxiety and stress. Since Shrink Yourself concentrates on making permanent changes, Gould reminds dieters that weight loss will not occur overnight. He places more emphasis on why you eat instead of what you eat and highlights changing the way you think about food and weight loss. As such, the book focuses on how to stop emotional eating and does not include any recommendations for specific foods and does not include a meal plan or recipes. This program does not offer food recommendations. Shrink Yourself does not include a sample diet plan. The book does not include exercise recommendations. Gould says that it is important to first stop emotional eating issues otherwise you are unlikely to be successful in maintaining an exercise regime. 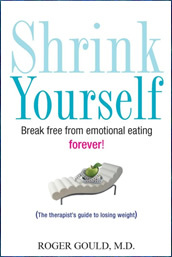 Shrink Yourself: Break Free from Emotional Eating Forever retails at $14.95. The 12-week online program costs $119.85 if paid up-front otherwise you have the option to pay $39.95 a month and only continue as far as you would like. Promotes a lifestyle approach to weight management. Provides an alternative to therapy sessions. Written by a qualified health professional. Online program offers a free session to help stop emotional eating. Will not appeal to dieters who don’t feel that emotional eating is involved in their ability to lose weight. Dieters may be confused about what to eat because Shrink Yourself does not include a meal plan or recipes. The Shrink Yourself program would be especially beneficial to assist dieters in whom emotional eating is a barrier to achieving successful weight loss. It is a very detailed and comprehensive program that will help dieters to better understand their eating habits and behaviors so as to gain control over their ability to manage their weight.